4/16/2012Share this story on Facebook! 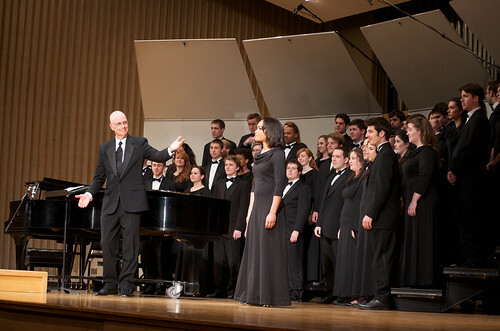 Professor Larry Doebler conducts the Ithaca College Choir during his final concert in Ford Hall. Photo by Matt Prokosch. Ithaca College’s Choir, the premiere choral ensemble made up of 48 singers-soprano, alto, tenor and bass- is also a band of travelling musicians. Or so they were during their 2012 spring break. Starting March 11, the IC Choir travelled to Albany, NY; Newton, NJ; Setauket, NY; and Glen Spey, NY and back on a whirlwind concert tour. 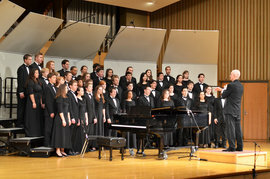 Professor Larry Doebler conducts the Ithaca College Choir during his final concert in Ford Hall. Professor Doebler has directed the Choir for the past 34 years. Photo by Matt Prokosch '13. Adiza Jibril, first year choir member, said this year’s tour was a lot of fun and being a member of the choir has truly changed her life and view of music. Not only is the music beautiful, she says, but the whole experience is healing. 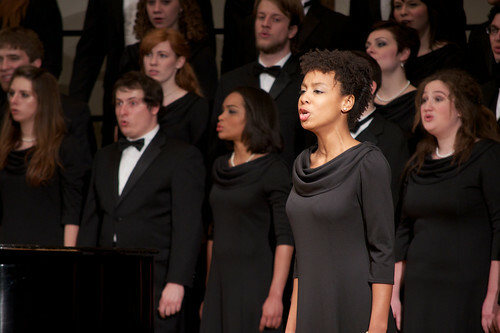 Adiza Jibril, Vocal Performance '13, performs a solo during the final performance of the Ithaca College Choir under Professor Larry Doebler. Photo by Matt Prokosch '13. During his 34 years as the director of choral activities, Larry Doebler has developed methods that focus on combining the knowledge gained in singers’ other classes and studies. One of their key techniques is making eye contact with the audience. Professor Larry Doebler recognizes Ana Strachan, Vocal Performance '12, during the Ithaca College Choir's final performance with Professor Doebler. Photo by Matt Prokosch '13. Doebler said each performance has a distinct experience and has an effect on their sound. Some of the major players in the experience are venue and audience. On the last night of the tour, the students were housed in a Tibetan monastery in the Catskills. Jibril said being at the monastery was her favorite part of the tour, and agreed that she felt so calm during the performance. 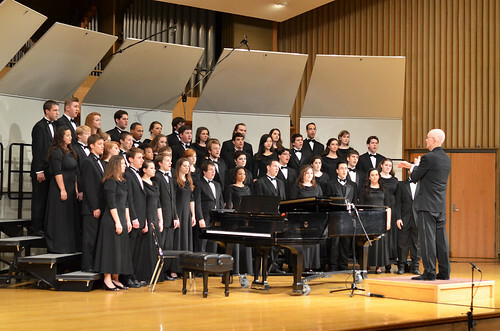 Since the tour, the choir has been invited to be the opening concert at the 2012 NYSSMA convention in Rochester. They will also be performing at Lincoln Center on April 19 2013 presenting Poulenc’s Gloria with the Ithaca College Symphony Orchestra.